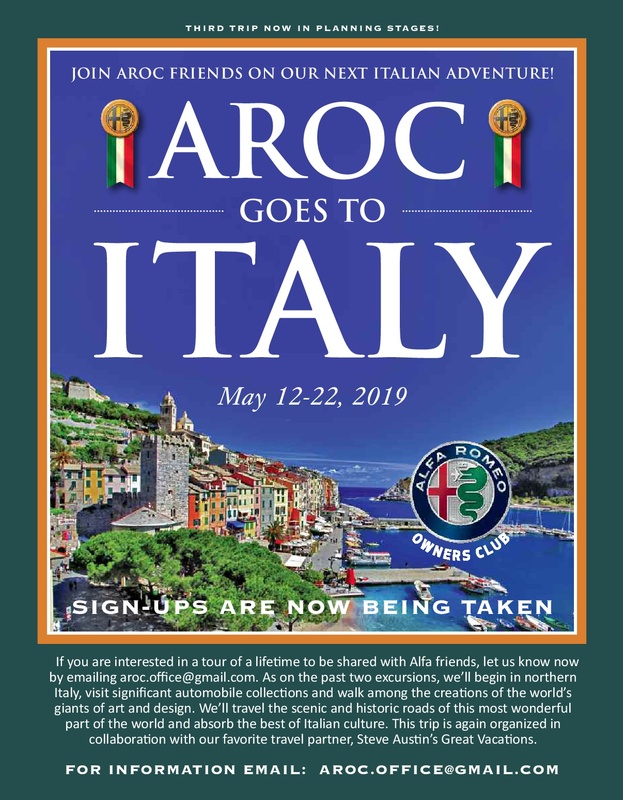 May 12-22 – AROC National – 3rd Annual AROC Goes to Italy Tour. Contact Cindy Banzer at c.banzer@aroc-usa.org for details. Join us in May 2019 for our 3rd annual fabulous visit to Italy! We’ll experience car manufacturers, museums, designers and, of course, incredible food. Highlighted are two extraordinary days, one with the new Alfa Romeo Museum and one with the ‘send off’ day at the Mille Miglia in Brescia. Sandwiched between these highlights are visits to manufacturers and showrooms like Lamborghini, Ferrari, Ducati, Maserati and of course, Alfa Romeo. The hotels and locations mirror the quality of this program. This tour will be planned and scheduled in collaboration with Steve Austin’s Great Vacations. Make plans now to experience this unforgettable Italian adventure, full of great fun and camaraderie! Join your AROC Board Members on an Italian Adventure! This tour will be limited in size, to approx 40 people – please register early! We anticipate that registration and deposit should be received by October 1, 2018. The fully refundable deposit of $1,000 per person is necessary to hold the reservation, and guarantee the pricing as well. The reservation would be cancelable with full refund of deposit until December 11, 2018. Pricing has been fixed at $4,980 per person, double occupancy.